Shirley Baker would have been in her mid thirties during the Swinging Sixties. Flower Power, The Beatles, Rolling Stones and so many of the ‘Beautiful People’ that have now become part of our social history and entered the language we use today. 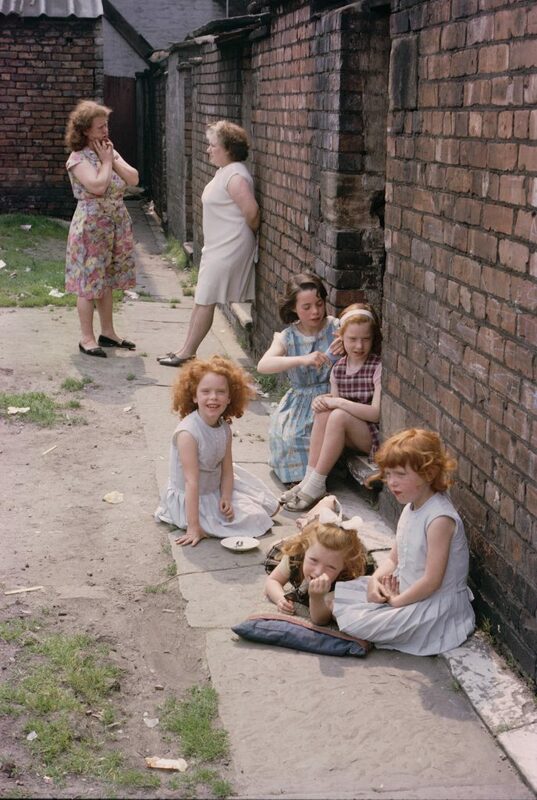 It would be possible to wax lyrical on how good these times were…….but as Shirley Baker shows not necessarily for everyone. 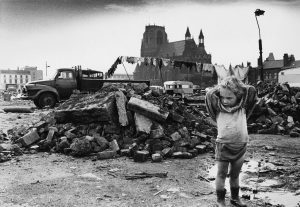 As someone who can identify with many of the images from Shirley Baker’s exhibition Women, Children & Loitering Men now on at Manchester Art Gallery, this was a must see for me. 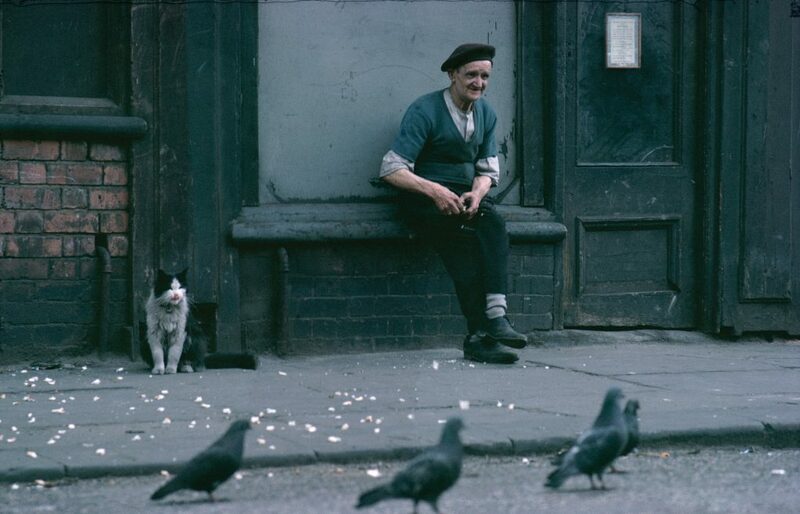 I grew up in what is now part of Greater Manchester, many of the streets looking just as those in Baker’s photographs. I too played on open ground and mounds of rubble as streets were cleared for new houses and tower blocks, and I saw the dismantling of communities in the name of ‘progress’. People I knew moving out to new Manchester ‘overspill’ estates, or to tower blocks and new schools. But to be honest, it didn’t mean a lot to me. I was only interested in football, playing with my mates on what we called ‘Bogey’s’. (little go-cart like machines made from an orange box with pram wheels and a plank of wood, with string to steer the front wheels). and collecting caterpillars. Children are resilient and adjust quiet quickly, making new friends and moving on themselves. As you can guess from the previous paragraphs, Shirley Baker’s wonderfully evocative photography brought back so many memories of my own childhood. When I visited earlier this week, the gallery was packed. Okay, so it was half-term, but I also saw many older people and parents explaining to their children, or grandchildren, that they too lived through the images on display, and also just like me, be heard telling their own memories and experiences of Manchester at this time, smiling as they did so. 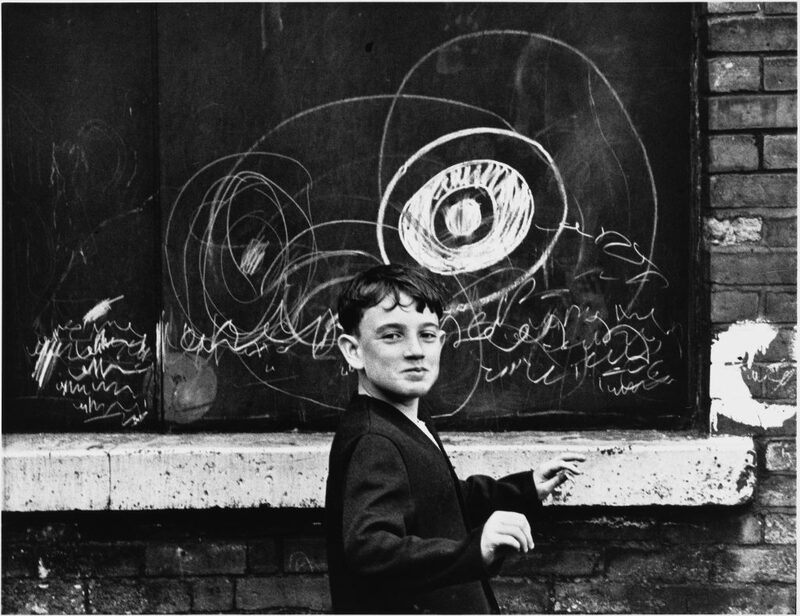 Shirley Baker was thought to be the only woman photographer practising street photography at this time, and her worked largely ignored. Documenting social history in this way is becoming increasing difficult these day’s as people are much more aware of how images may be used, making the photographs shown here all the more precious. The style of Baker’s photography also shows similarities to Strange and Familiar, Britain as Revealed by International Photographers which was recently on at MAG, (You can read my blog here ) in their gritty realism, showing life as it is, no glamour, no staged photographs, but people in everyday situations and the images of urban decay, demolition, empty building and kid’s with dirty faces. In my opinion MAG do photography exhibitions exceptionally well. This is the third exhibition I’ve blogged on including Strange and Familiar, and Vogue: 100, which marked the 100th anniversary of the publication of Vogue magazine,(Blog and images here ) and with its sumptuous colour, high fashion and extravagance was a polar opposite to Strange and Familiar and to Shirley Baker: Women, Children and Loitering Men. 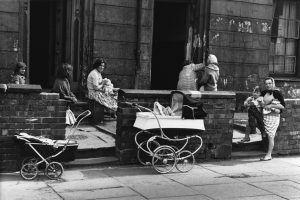 Whether your interest is in social history, you lived through it yourself or you just love great photography Shirley Baker: Women, Children and Loitering Men 19th May – 28th August 2017, is an absolute must.